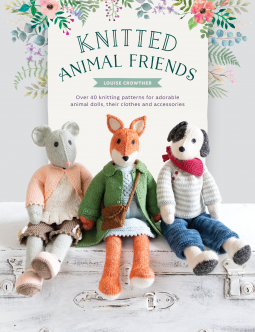 A perfect project: Knitted Animal Friends (Crowther) – Joyce's mystery and fiction book reviews with some non-fiction too! This is a gorgeously formatted and photographed book of knitting projects. There are plenty of directions including a list of tools and materials and a noting of abbreviations used in the instructions. As you can see from the book’s cover, each animal friend is fashionably dressed and shows personality. The animal friends would make a perfect (purrfect?) home made gift for a baby or adult with a soft spot for critters…or make some for yourself. Many thanks to the publisher and NetGalley for this lovely book of projects. All opinions are my own.